Ada pertanyaan untuk Yundeng Landscape Hotel? Ketika mengunjungi Chiayi, Anda akan merasa layaknya di rumah ketika berada di Yundeng Landscape Hotel yang menawarkan akomodasi berkualitas dengan layanan luar biasa. Dari sini, para tamu dapat menikmati akses mudah ke semua hal yang dimiliki oleh kota yang aktif ini. Untuk menuju berbagai pilihan lokasi jalan-jalan dan obyek wisata setempat, Anda tidak perlu pergi jauh-jauh karena properti ini terletak dekat dengan Kuil Wufong, Carrefour Tourism Night Market, Zhuqi Riverside Park. Setiap upaya dilakukan untuk membuat tamu merasa nyaman. Dalam hal ini, properti menyediakan pelayanan dan fasilitas yang terbaik. Fasilitas terbaik properti ini termasuk WiFi gratis di semua kamar, layanan kebersihan harian, akses mudah untuk kursi roda, satpam 24 jam, resepsionis 24 jam. Akomodasi properti telah dipilih secara cermat demi kenyamanan maksimum dengan adanya televisi layar datar, telepon di kamar mandi, lantai karpet, produk pembersih, kopi instan gratis di beberapa kamar. Fasilitas hiburan properti ini seperti hot tub, pusat kebugaran, lapangan golf (sekitar 3 km), spa, pijat dirancang untuk bersantai. Yundeng Landscape Hotel adalah pilihan yang cerdas bagi para wisatawan yang berada di Chiayi dan menawarkan pengalaman menginap yang menenangkan setiap saat. There are quite a lot of facilities. The room is comfortable to stay. There is bathtub. However the bed is facing the mirror which is quite scary. Dear guest, Thanks for choosing Yundeng Landscape Hotel to stay. We feel so sorry if it causes any inconvenience to you. Thank you so much for the suggestions you kindly offered us, so that we can have a chance to overcome it. We wish that you will keep on supporting us and hope to see you again. If you wish for a place to do nothing, you can consider this hotel. It has golf course and life pace here very slow. Food wise not convenient but hotel provided good food. Do note that this hotel is not directly at Alishan bottom, from hotel to Alishan to see sun rise, you need at least 2 hour drive! Dear guest, Thanks for choosing Yundeng Landscape Hotel to stay. We wish that you will keep on supporting us and hope to see you again. Great 3 days 2 nights stay and will definitely come back again. Room is big, nice & super clean. We love to spend our time at the roof top open space for our beer and drinks . Its cool. Staff are very friendly. The only cons is the location but fortunately transport was provided to bring us to the nearest bus-stop to get to Alishan. Overall a great stay. Very disappointed with the same set breadfast serving with preserved pickles/porridge/salad and fried food for our 2 days stayed. Hotel was not well maintained although less than 10 years. Location is far from chaiyi train station and more than 1 hour drive to alishan. Need 3 days advanced booking with hotel in order to arrange transport to train station. we stayed for two nights, the staff were very helpful and the resort itself has an amazing view outlook into the golf course. The room itself is amazing with great facility, the only down side is that there were not many food stands around. The nearest convient store is HiLife which is about 10 min walking distance. The resort offers shuttle service to nearby bus stop and attractions, great for travellers without cars. We really enjoyed the free admission to Green Farm and all other little surprises arranged for us on our stay. We had a wonderful stay at Grand View Resort. We were driving ourselves and we don't speak or read Chinese. We got lost trying to find the hotel, so we rang the hotel. We spoke to Candace who came to look for us and meet us and we followed her back to the hotel - thank you!! Upon arrival, Candace moved us to a bigger room as we were travelling with our young daughter. The rooms were clean with modern features and free wifi. All the staff were helpful and always greeted us with a smile. The grounds are beautiful and there is a golf course as well. The view from the rooftop cafe is breathtaking especially at sunset. The food in the restaurant was well presented in buffet style. We ate on the verandah several times and it was so lovely. It is clear that the staff work very hard and always with a smile. The hotel is located just over an hours drive from Alishan. As we were heading to Alishan early in the morning, the hotel offered to put together a breakfast box for us which was a nice touch. If we visit the area again, we will definitely stay here again. We booked 2 standard room and got free upgrade to Luxury Twin Room with golf course views. The view was perfect especially the sunset. Staff is nice and helpful. They also provided different choices of snacks at free in the room. Room is spacious, clean and comfortable. Definitely our Favorite Hotel during our 4 weeks in Taiwan! Why? 1. Room was amazing! Clean and spacious with a gorgeous view of the golf course and mountains! 2. The staff was exceptional!! Very nice, and went above and beyond to make us feel welcomed!!! 3. The food in the restaurant was fabulous!!! Dinner is the Best we had in Taiwan... for an affordable price!!! Five courses including dessert and coffee. The only con is that it is a long taxi drive from the HSR... but totally worth it!!!!! You will not regret staying here!!!! Though it is a bit far out of the city,, that makes the 'Grand View Hotel (aka Yundeng Landscape Hotel) even more unique and soectacular!! 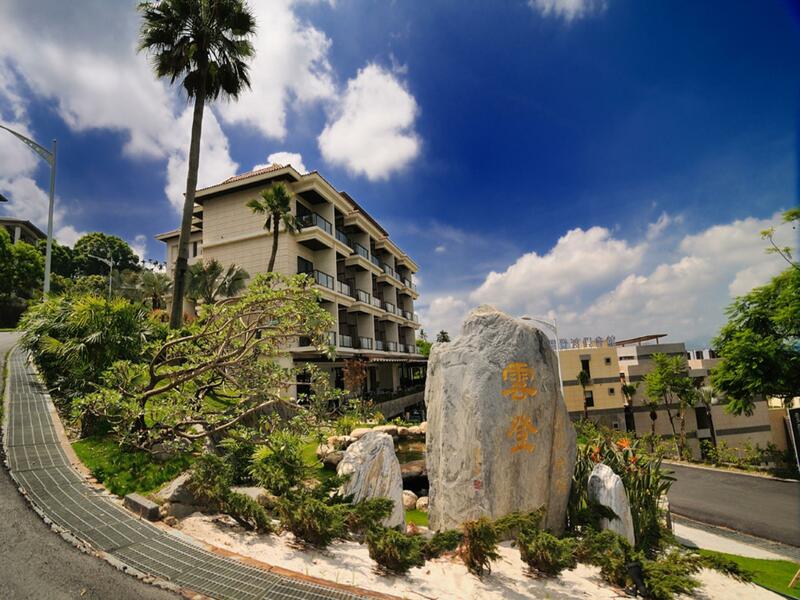 Built atop a hill with a grand view of a gorgeous golf course and city lights of Chiayi, it is beautiful and peaceful. The restaurant is amazing, serving five course meals for just 540 NTD . Best food we have had! And the staff is superb! Attended to our every need! It is the little things they did that WOWED us!! There is a shuttle service for those of us without cars! A real top 5 star hotel! I will go back!!! The hotel has a nice view. There is a golf course in the resort, and some of the rooms are facing the golf course. We booked a standard double room and a family room. Unexpectedly, both rooms seem to have similar size, and so the family room is a bit compact, with two king or queen size beds in the room. But the washroom is spacious. Also, only the standard double room has the golf course view. The buffet breakfast is good. The staff are nice. Overall it is a quite good choice! we eventually became friends with the hotel staff. they were extremely nice and introduced the place and good food to us. ridiculously large room. really suitable for honeymoon type of relaxing trip. however, it is 1.5 hour away from A Li San, becareful, 30min away from main station (Chiayi). it is nowhere close. The room design, bathroom, scenery and staff were amazing. The room is well designed, and you can enjoy a relaxing bath in the bathtub. The room view I was in (3007) is gorgeous, scenic view of golf/grass fields and mountains beyond. What was really, really amazing was the staff, they were so friendly and helpful. They always tried their best to make my day easier and advise me the best way to Alishan mountain. - there is free bus shuttle service, you have to call in advance to notify them about your pick up time and where abouts. Overall, a great stay. It was my second time here, the staff still remember me, surprisingly. They greet us with full of enthusiasm and beautiful smile. The staff very helpfull to fiind out in the destination that we want to go for sightseeing. The English is limited but it enough to understand each other. The room is clean and need. It us quite chic also in term of th design. Love he view from the balcony . The staff are very warm, welcoming and very accommodating. Their English language is quite limited but enough to get by and they willing to try. The room is very nice and clean.The view is calming, especially in the morning or at night on the balcony. The restaurant food is nice and they willing to accommodate for those on vegetarian diet or those who cant eat pork. On the down side. The pillow is a little hard and there is only one pillow per person. The television have not much variety for the English speaking people. I stayed in two places in Alishan. One is the Zengit Cafe and the other is the Yundeng. While the Zengit Cafe offers almost impeccable services and facilities the Yundeng is like a low budget motel in terms of room facility and services. The view here was amazing but not the hardware. With the exception of the hotel driver who was really nice, the reception staff was rather local and started sniggering when I asked if it was possible to get a room change given the shock of my shock with how the hotel toilet looks like in one of the rooms. While they did offer to let me change I had to go through the ordeal of them pretty much showing me how ridiculous this request was. If you are not here for golf would definitely recommend staying elsewhere as this place is really far away from the city centre.